How to select and edit assets and licensors for a new or existing contract. When creating a new contract or editing an existing contract under Rights, the fourth tab that appears is Assets. Identifying licensors and their assets may be edited at any time. In this tab, determine the licensors and assets that this contract will apply to. Select either Artist or Label from the drop down menu. Enter the name of a Licensor that will be included in this contract. Select all assets: All tracks and releases currently in your asset catalog and assigned to the selected artist or label will be included. Select some assets: When this choice is selected, a dialogue window will pop up allowing you to choose any assets currently available in your catalog assigned to the selected artist or label. If you have selected all assets, you may also assign this contract to all future assets held by the artist or label. 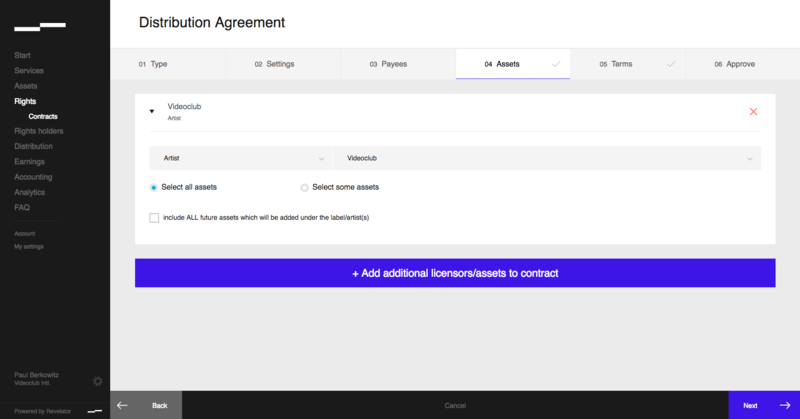 Add any additional artists or labels that will be governed by this contract, and then click next to continue.